Learn how to upgrade your apartment with a spa-like bathroom! Special personal touches make all the difference in an apartment, especially in the bathroom. Your bathroom should bring you comfort, and feel as though you just entered a luxurious spa. Continue reading for a few easy ways to upgrade your bathroom to create a calming oasis. What’s better than wrapping yourself in a soft, fuzzy towel after a hot shower? Purchasing a few luxurious towels is always worth the investment to bring you the comfort you deserve. However, you don’t have to spend a ton to find quality towels- think of places like TJ Maxx that sell name brand products at a discounted price. Find a few colors that match your bathroom, and layer smaller hand towels over the bath towels for a lavish, layered look. A floral-scented candle immediately brings a calming effect to your bathroom, especially when getting into a bath with the lights dimmed. Candles and flowers have a calming presence and are perfect additions to upgrade your bathroom into a relaxing space to unwind at the end of the day. While candles are great for bath time, it’s not safe to leave candles consistently burning, especially when you leave the apartment. Instead, stick to a diffuser to keep your bathroom smelling clean and fresh all day long. Choose a soft scent like lavender or jasmine, and your bathroom will smell as though you just stepped into your favorite spa. 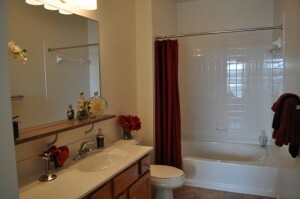 Treat your bathroom just like any other room in your apartment by hanging decorations and artwork on the walls. Simple pieces often bring a relaxing atmosphere to the space, while more bold and colorful pieces bring happiness and personality. Choose art that brings you the most joy, and you’ll always feel a sense of happiness when entering your at-home spa. This entry was posted on Friday, March 2nd, 2018	at 3:56 pm	. Both comments and pings are currently closed.